Product images do not reflect actual cushions and are only a model representation of the product type. Colors, styles and sizes may vary. Please note, due to varying screen resolutions, fabric may appear different in person. At Cushion Corner®, we offer a large selection of indoor/outdoor fabric. Select from our in-stock fabric by clicking the fabric window to the right. Can’t find a fabric? With Cushion Corner®, you have the option to order from many specialty fabrics or provide your own! We work with various brands including Sunbrella, Bella Dura, Outdura, Perennials, Robert Allen and more! Call us today for assistance with your custom design. Piping is a cord like trim sewn around the perimeter of a cushion or a pillow. Piping fabric typically matches the body fabric exactly but one can also have a contrast fabric as seen here. Our standard and most popular piping size is 1/4" diameter. (i.e. 18, 18.25, 18.5, 18.75). At Cushion Corner®, we have the ability to custom make your cushions to any custom size and shape. Don’t see what you need here? Call us today for assistance with your custom design. Standard foam is a 1.8 oz., white polyurethane foam wrapped in a thin polyester layer. Standard foam is ideal for indoor use. High Resiliency foam is a high quality, yellow 2.5 ounce polyurethane foam wrapped in a thin polyester layer. Ideal for indoor or minimal outdoor use. Reticulated foam is a 1.8 ounce foam core wrapped in a thin polyester layer. This foam is designed for outdoor use and allows water to drain through porous texture. Netting is a gauze-like material used to wrap around the polyester and foam core insert. This option is perfect for creating ease when removing the insert from the fabric cover, especially for cleaning. A netting wrap keeps the polyester and foam core secure and helps prevent the polyester sheet from shifting as pressure or movement is applied to the insert. Please review summary for accuracy of fabric, dimensions, all options and quantity. Once your order is processed, changes or cancellations are not guaranteed. At Cushion Corner®, we offer multiple corner options including shamfer, notch and trapezoid shapes. Don’t see what you need here? We can customize your cushions to any specifications. Call us today for assistance with your custom design. Create custom cushions to fit your round indoor/outdoor furniture. These cushions are created in a box style, which is configured with a top, bottom and center. Select from our wide range of in-stock fabric or provide your own. Select from our insert options and accents to make your creation one of a kind. Our custom cushions are beautifully crafted to last for years with proper use and care. Have a question? We’re glad to help! Call us at (805) 285-0635 or email info@cushioncorner.com to get started with your custom cushion project. At Cushion Corner®, we promise to deliver you with top-quality custom cushions. An important component of our cushions are the premium foam inserts. Unlike mass produced cushions, made solely of polyester fill, Cushion Corner® cushions are always crafted with an upholstery foam core, and book wrapped with high-loft polyester for maximum comfort and usage. 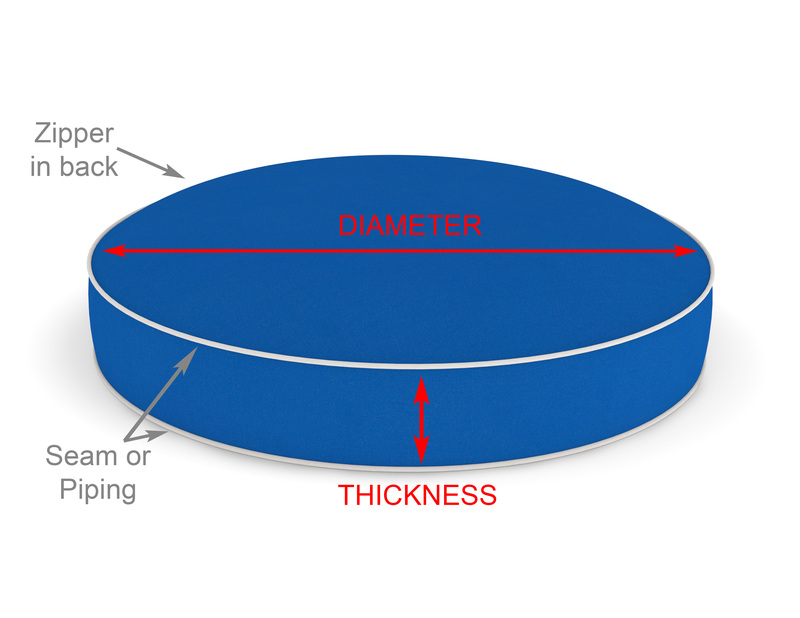 At Cushion Corner®, we offer you the option of selecting from 3 levels of foam inserts. Our standard base foam is already a step ahead of the rest. Constructed of 1.8 lb/ft³ white polyurethane, this foam insert is ideal for indoor usage and designed to provide years of enjoyment with minimal sagging. The next level of foam is high resiliency (HR) foam. This higher-end foam is made of 2.5lb/ft³ yellow polyurethane. This foam provides a higher bounce rate and will outlast standard foam by several years. High resiliency foam is intended for use with very high-end indoor cushions. 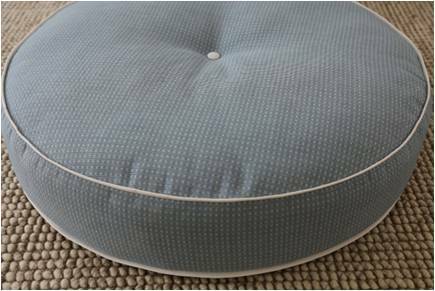 For a luxuriously durable outdoor cushion, we offer a reticulated EZ-dri foam insert. Our reticulated foam is comprised of 1.8 lb/ft³ polyurethane and allows water to drain through its porous texture. This foam is the best option for outdoor usage. Whichever insert you select, rest assured you will receive a superior, finely crafted product. All 3 levels of our foam include high-loft polyester wrap for maximum comfort and easy cover removal. Furthermore, you have the option to add a gauze-like netting cover to your insert. Our netting material holds the insert firmly together, while allowing for smoother removal and replacement. Cushion Corner® covers include a durable YKK® zipper, and all inserts utilize sustainable adhesives that are odorless and environmentally friendly. Every Cushion Corner® product is 100% American made and sourced from local factories to provide you with the best custom cushions available. Load More Loading Please wait...!